The spectators pass into the open spaces surrounding the arena where merchants and food vendors hawk their wares. The scent of fresh bread, roasted meats, and sour wine waft through the crowd to mingle with the odor of sweat and hair pomade. People look at their wooden tickets and enter the appropriate gate to spread throughout the amphitheater: the front rows reserved for the leading citizens; the middle for the lesser knights and merchants; and the top for the poor, slaves, and women. Some resent the class divisions at the arena. At the chariot races in the hippodrome, it’s open seating (except for the emperor, of course!) and women mix with the men. Valens, his son, and their guests occupy the box, first row and center in the arena. As editor—giver of the games—Valens has the prime seats where he can see and be seen. The twenty thousand spectators settle in their seats for the morning program of animal hunts and beast fighting. The air is still cool and the sun bearable so the velarium—the sail cloth awning furled around the edge of the arena—stays in place. A trumpet blares for attention and the narrator announces the first act—a bull and bear fight. One of the crowd’s favorites! The two animals are chained together and provide a thrilling opening as they gore and slash each other, roaring their rage and terror, until both die of their wounds. Very satisfying. Unfortunately this is followed by a boring hunt. Trained dogs chase hares, catching and releasing them over and over. Why did Valens bother? At least he could have provided a trained lion or cheetah instead of hounds. The crowd grows restless and the narrator signals the final morning act: a wild beast hunt. Gazelles, deer, and ostriches are released into the arena followed by three Kushites with their long compound hunting bows. Wait! One of the bowmen is a female! This is different. And she’s very good, taking down two animals for every one of her companions. The crowd appreciates her prowess, but they are restless. Where are the great cats, vicious wolves, or exotic African animals? It’s noon and the sun grows warm. Cloaks worn in the cool of the morning are now folded and serve as padding for the stone seats. Sailors deploy the velarium, providing relief to the audience and causing an updraft over the hot sand. Attendants remove the dead animals and clean the sand, but the stench of rotting flesh and feces pervades the air. Those people who thought ahead, sniff perfumed cloths. Others unpack food and drink or buy it from the vendors walking the aisles. Some folks gossip with friends, visit the vast lavatory where men and women mix freely, or hire a prostitute for a quick release against the damp walls of the dark tunnels. A slave plays a lively tune on the water organ. Bookies shout out odds on the coming fights and collect wagers. After the noon break, the trumpet blasts and the narrator announces, “Criminals executed by beasts!” Ah! That’s what Valens saved the savage beasts for. Guards lead a string of seven murders and runaway slaves onto the sand. They are chained neck to neck and their hands are bound. A slave passes by each with a bucket of fresh blood and a brush to splash the gore on the criminals. Two of the men call out for mercy and fall to their knees, sobbing. It’s obvious they are slaves. No Roman citizen would so cowardly meet his fate. Beast handlers wheel three cages onto the sands and the crowd can hear the roar of the angry beasts inside. Finally, the guards unlock the prisoners’ neck chains, but leave their hands bound, and run for the exits. The beast handlers open the cages and poke the animals through the bars with barbed spears to get them onto the sand. A leopard bounds out of one cage and makes immediately for the huddled men who scatter to the four winds—to no avail. The leopard leaps on one man’s back, biting efficiently through the neck to bring him down. A female lion joins the attack, but a male lion seems reluctant, even when prodded by the beast handlers, until his mate brings down a second man, then he joins the feast. A pair of wolves prowl the edges of the sand keeping a wary eye on the big cats as they stalk a man. The hungry animals make short work of the criminals and the crowd thrums with pleasure. Tension heightens as the long awaited gladiator fights draw near. The crowd suffers through the pageantry: Hercules Victor in the form of a wooden effigy, Valens, and various politicos parade around the arena in chariots leading the gladiators armored, but not armed. The fighters pair off and spar with each other using wooden weapons to warm up, while a local blacksmith tests each of the real weapons for sharpness. He touches up one sica—a deadly curved sword used by Thracian style fighters. Finally! Valens takes his seat, the blacksmith certifies the weapons, and the first pair of gladiators is announced with a flourish of trumpets and pipes. Another surprise—Atalanta and Amazonia are announced and two women come onto the sand. Atalanta fights as a retiaria with net and trident and Amazonia as secutor with full shield, gladius, and the all-encompassing helmet. They weren’t advertised in the lineup and didn’t take part in the parade. The crowd mutters, trying to decide if it’s pleased or disappointed. Is this another delay until the real fighting begins? Long time veterans cry, “Remember Afra!”—a Kushite woman and local favorite who fought as a myrmilla several years ago. The crowd settles and is not disappointed. After several minutes of skilled fighting, Atalanta has tangled Amazonia in her net and threatens her with her trident. Amazonia raises her hand, index finger outstretched in the sign asking for mercy. The crowd, pleased with the novelty and skill of the women, grant missio and both women leave the arena to fight another time. The next three match ups do not fare so well. They are tirones—new recruits. 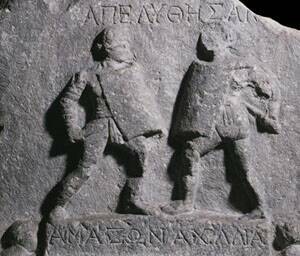 The summa rudis—referee—has to beat a hoplomachus with his heavy rod to make him fight. Those that lose, but survive are given no mercy by the crowd. But the fights are ordered by skill and each one gets better. The best fighters come last. When they lose they are more likely to be spared by the crowd or the editor (who has to pay the owner the price of dead or injured gladiators). 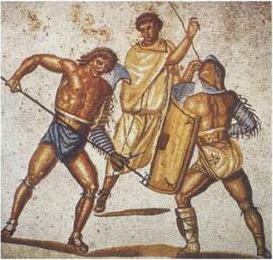 When the fourth pair comes on the sand—a myrmillo and Thracian—the loser provides such a good show, the crowd relents and Valens gives mercy. The audience gets rowdier, calling out advice to the fighters and loudly lamenting betting losses. Two scuffles break out, but Valens’ men swiftly apprehend the brawlers and eject them from the amphitheater. Valens doesn’t want a repeat of the riots from several years back which resulted in the Senate closing the arena. Only the devastating earthquake in Nero’s reign allowed them to reopen. Of the six remaining fights, one man is killed in the combat, one is badly wounded and offered mercy, and four survive with light wounds and the mercy of the crowd. All eleven winners receive a purse of coins and a victory frond which they wave to the crowd as they process around the arena in a final display. The sun grows low in the sky and the velarium has long been furled. The crowd puts on their cloaks against the evening chill as they exit the arena and head for home or taverns to relive the fights with family and friends. 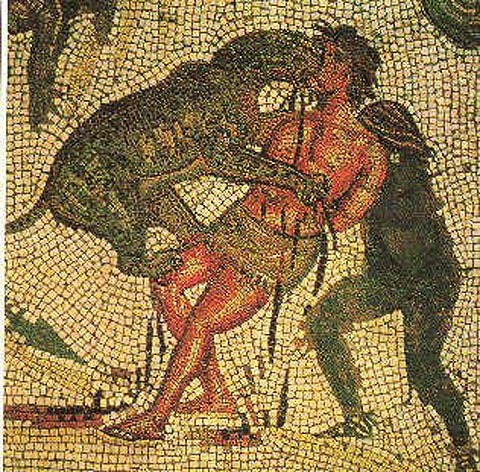 A most satisfying day: dozens of animals, seven criminals, and four gladiators—a higher than usual number!—dead; a wild beast execution, and the surprise of women in the arena as huntress and fighters. And this was only the first of five days. What entertainment will Valens provide tomorrow? This article first appeared at Unshelfish, July 2015 as part of a blog tour for my novel Sword of the Gladiatrix. Most of the action is based on documented events. I’d like to quote a response to a question you asked Ursula Le Guin in 2000. It’s on the Writer’s World website. This is not for publication, and I’d of course, site you and the website. I’m an English major finishing my senior creative writing project, and found Ms Le Guin’s reply very interesting.